This is a totaly homebrew project. It is not a properly controlled environment scientific test, so take it for what it's worth. The camera used was a Canon 40D. All photos taken in RAW and converted with identical settings of at least sharpness. The files are .jpg exported at 100% quality setting. They are about 8Mbytes each. 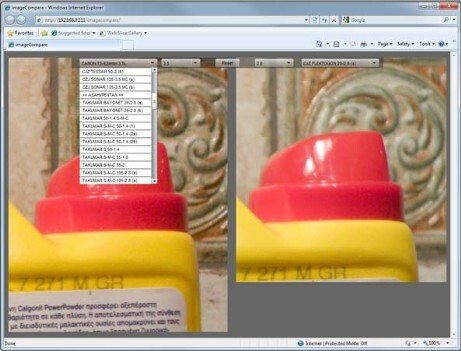 You will need Flash Player 10 to see the comparison utility. Open link and maximize explorer window. Select a lens and aperture. If the combination exists the file will be downloaded and displayed. If not, a red X will tell you so. Do the same for both halfs of the screen. Use the mouse to drag on the left half of the screen. The area of the photo in the right half follows. Drag the right half as a floating panel to move it closer to area of interest. RST buton moves it back to initial position. Note: The flash application leaves a lot to be desired. It is only a quick and dirty job in early alpha state.